"Our nation has lost its greatest son. Our people have lost a father. Although we knew that this day would come, nothing can diminish our sense of a profound and enduring loss." The world mourns the death and celebrates the life of Nelson Mandela who died peacefully last night, 5th December (Irish time), at the age of 95. According to South African President, Jacob Zuma, he was surrounded by his family at his home in Johannesburg. I was watching a debate on RTE television when it was interrupted with the tragic announcement. The rest of the programme was taken over by Nelson Mandela news and footage. Ordinary citizens and national leaders around the world joined together in mourning Nelson Mandela. He spent 27 years as a prisoner in South Africa for opposing apartheid and then became his country's first black president. In addition, he was a winner of the Nobel Peace Prize and an enduring symbol of integrity, principle and resilience. In June this year, Nelson Mandela was admitted to a hospital in Pretoria for a recurring lung infection. He spent three months there and then was allowed home. Nelson was incarcerated in prison for 27 years in prison serving 18 of them on Robben Island because he was the leader of the armed wing of the African National Congress. Being a true diplomat in the highest sense of the word, he followed a route of peace and reconciliation and was recognised the world over. Our very own Dunnes Stores workers went on strike 30 years ago for a very long time refusing to handle goods from South Africa because of apartheid. This in turn led to a change in the laws in Ireland. He was the only man able to refer to the Queen as “my friend Elizabeth”. His sparkle outshone a galaxy of stars the world over. In Washington, President Obama called him one of the "most influential, courageous and profoundly good people to ever have lived". "He achieved more than could be expected of any man," an emotional President Obama from the White House said. "He belongs to the ages." He ordered U.S. flags to be lowered immediately to half mast until Monday evening in tribute to Nelson Mandela. Bill Gates, the world’s richest man, shared a passion for improving health care with Nelson Mandela. 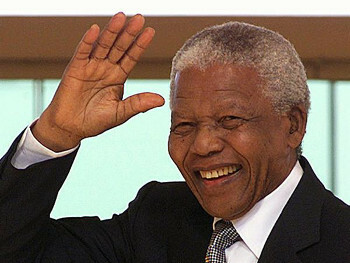 The Dalai Lama said that Nelson – a fellow Nobel Peace Prize winner – was the person who has impressed him the most. Princess Diana called in on him while visiting with her brother, Earl Spencer, in Cape Town. He said at their news conference: “I never attracted so many reporters. It’s Diana who’s so popular. It’s not often that I meet princesses. I’m still trembling.” She offered him her support in fighting Aids. Michael Jackson met him so they could jointly work on charity projects. He described Michael as “a close family friend”. Naomi Campbell met him and he called her “my honorary granddaughter”. Hilary Clinton was one of the last people to visit him in August, apart from the ANC and his family. The visit had the sense of a fond farewell. If those aren’t examples of pure diplomacy, I don’t know what is.